The Poinsettia plant (Euphorbia pulcherrima) is a perennial shrub that belongs to the Euphorbiaceae family. It is native to Mexico and Central America. The Poinsettia gets its name from Joel R. Poinsett, who introduced the plant to the United States when he was U.S. minister to Mexico in 1825. It is one of the most popular flowering potted plants in the United States, over 70 million are sold nationwide each year. 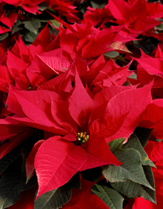 The colorful, flower-like “blooms” of Poinsettias are made up of bracts (modified leaves). The actual flowers are the small yellow blossoms in the center of the bracts. 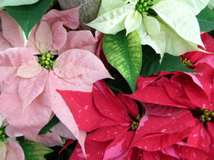 The most common color of the Poinsettia is a brilliant red; however, breeders of this plant have produced cultivars resulting in a variety of colors, such as white, pink, yellow, peach. Some cultivars are marbled, or speckled in appearance. A common myth is that Poinsettia flowers are poisonous. A study conducted at the Ohio State University concluded that no toxicity was evident at experimental ingestion levels far exceeding those likely to occur in a home environment. Bracts & Leaves – Bracts should be completely colored (no green around the edges). Leaves should be dark, rich green in color (avoid yellow leaves). Look for full, dense foliage all the way down the stem to the soil line. Shape & Size – Choose a plant that is 2 ½ times taller than the diameter of the container. Check the Poinsettia from all sides. It should look full and balanced. Age & Durability – Check plant for signs of wilting. The foliage and bracts should be bright in color, and show no signs of breakage. Select plants with stiff stems, and no signs of breakage. Check the soil daily. Soil should be moderately moist. If it is dry to the touch, water the Poinsettia thoroughly. Water should run out of the drainage hole at the bottom of the container. Do not allow this plant to sit in standing water – this could cause root rot. Place the container in a location that receives bright, indirect light. Ideally, Poinsettias should receive six or more hours of bright, indirect light. Direct sunlight can fade the colorful bracts of the plant. Temperature should not exceed 70° F, and not fall below 50° F. Avoid placing plant near hot or cold drafts – this could cause leaves to drop. Poinsettias do not require fertilizer when in bloom.